When it comes to gutter cleaning robots there really is only one on the market to speak of and that is the Looj from iRobot. Looj is a fantastic product invented so that you would not have to stand on a ladder and reach to clean out your gutters. This product can make cleaning your gutters go from a project that will take a full day to a project that will take less than an hour. The video below is of the inventor of the Looj. He speaks about how the robot works and how it came to be. The Looj comes with a belt clip holder. You clip the holster to your belt and carry the robot up the ladder in the holster. No hands are required. Then lifting the robot by the handle, you place it in your gutter. The handle then detaches and is used as the remote control. You has a control for the direction of movement – either forward or backward, a control for the direction of the spinning auger – you need to change the direction when you change the direction of movement, and an on and off switch. As the auger spins, it dislodges, lifts, and tosses the debris right out of the gutter system. When you have finished cleaning a section you just need to reattach the handle, put the Looj back in the holster and climb down the ladder. Some advantages of the Looj over traditional gutter cleaning are that it is fast, safe, and inexpensive. 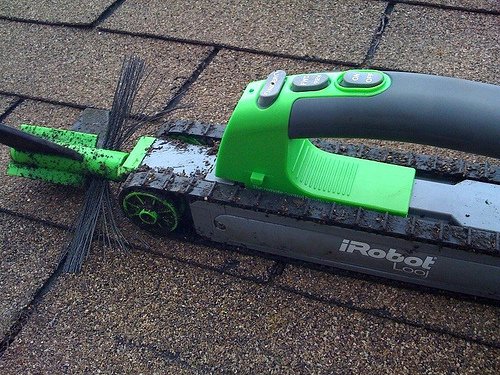 You can use the Looj robot to clean a sixty foot section of gutter in just ten minutes. If you had to clean that section by hand, you would need to get on and off the ladder several times and it would take you much more than ten minutes. It is also safe. No more over reaching and risking falling off a ladder with this product. In addition, there is no need for you to come into contact with the mold and mildew inside the gutters. The Looj will do the scrubbing for you. The Looj operates on a rechargeable battery. You can get about an hour of operation for every fifteen hours it charges. That is more than enough to clean the gutter on an average sized house that has about 200 linear feet of gutter system. The large rubber tracks can handle moving over downspouts with no problem. It is small enough to fit under gutter straps. In addition, it is waterproof up to one foot of water, which means that you can operate it when there is a small amount of standing water in the gutters and you can hose it off when you are done to clean it. Finally, the auger is a replaceable part. So when you wear one out, you do not need to replace the entire machine, only that part. Overall, the iRobot Looj is an extremely helpful tool that is available for a reasonable price. You can get the basic 125 model for $129.99 from iRobot. Some retailers have them on sale occasionally. The 235 model comes with a hard case for storage and retails for $149.99. The 155 model comes with the hard case and a second battery. That way, you can always have a back up if your house in extremely large or you start with a battery that is not fully charged. The 155 retails for $169.99. You would pay as much if not more for a professional gutter cleaning service every year so I think the iRobot Looj is well worth the investment. The only downside to gutter cleaning tools like this is the fact that the Looj throws the debris out of the gutters and down the side of your house and into your yard. After the Looj does its work, you need to go around your yard cleaning up all the debris and possibly even washing off your siding. That is why I think it is best to use the Looj when the weather has been dry for a few days so only dry debris will be flung out and that will not stick to the side of your house and can be left in the yard to decompose on its own.